2017 was also the year in which the substance GenX attracted a lot of media attention. KWR, together with RIVM, produced a report for the water companies on the presence of GenX in drinking water and drinking water sources in parts of the Netherlands. The report was sent by the Ministry of Infrastructure and Water Management to the Dutch Lower House. 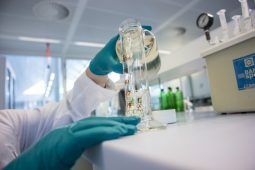 It showed that concentrations of GenX in all of the Netherlands were below the guideline value set by RIVM and that the drinking water was therefore safe. Nonetheless, public concern remained high through the year, and we were frequently contacted by journalists with questions about GenX or comparable substances.